Troy Night Out @ RCHS! John Kelly, a retired US Army officer, dressed in full WW I soldier's uniform, will have on display all the necessary equipment a WW I soldier needed, including mess kit, guns etc. 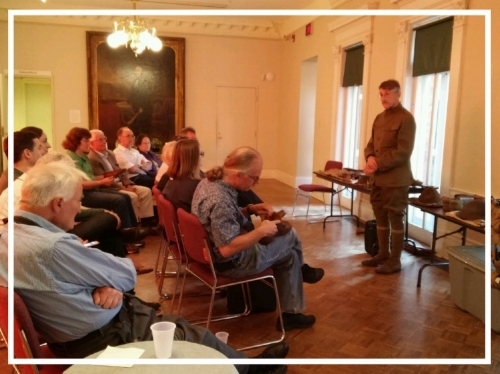 At both 6 & & 7 p.m. John will also speak about the conditions soldiers encountered living in the trenches or operating reconnaissance balloons during the Great War. This program is on conjunction with the exhibition From Doughboys to Dylan: Changing Times on the Rensselaer County Homefront. Click HERE for our T.N.O. Facebook Event Page! Parental supervision is suggested for children under the age of 12, as there will be rifles and trench warfare present. Thank you for understanding.